Where the mains lighting luminaires are specified and agreed and there is a preference to use some of them as emergency lights, P4 can convert most mains lighting luminaires to emergency operation. Fastel Within brings all the advantages of technologies into converted mains lighting luminaires. P4’s conversion process is third party accredited and in addition to re-CE marking of converted luminaires P4 provides a warranty for the complete converted products. Customers can choose luminaires and signs from two or more manufacturers, for conversion to incorporate P4 self-testing technologies. Luminaires of the same designs can be used for both mains and emergency lighting. Conversion to emergency operation, of most fluorescent and LED mains lighting luminaires is possible. Fastel fully automatic self-testing technology incorporated as standard. Fastel Link, Fastel Wireless or Fastel SRM technology incorporated as required. systems compatibility normally possible even with dimming and presence detection facilities incorporated. Certification of compliance with ICEL1004* accreditation scheme. Temperature and EMC type testing of all conversions. Full conversion records retained for future reference. All conversions CE marked to show compliance. Full warranty transfer to P4 of original luminaire. Extended warranty of conversion equipment, including 6 year battery warranty. P4 has long been an active member of the Industry Committee for Emergency Lighting (ICEL) and accredited by ICEL to carry out the conversion of mains lighting luminaires through the ICEL 1004 scheme. The ICEL 1004 scheme is regulated by ICEL and designed to ensure that organisations accredited under the scheme operate their conversion service only in accordance with the requirements of the scheme, which will provide assurance of compliant products, converted using suitable materials and best practices. In accordance with the requirements of the ICEL 1004 conversion scheme, the warranty of any mains lighting luminaire converted by P4 to emergency operation, is accepted by P4. In addition, emergency lighting modules and batteries fitted to convert luminaires are covered by P4’s industry leading warranty. A sample of every mains lighting luminaires conversion by P4 is fully tested for compliance to the harmonised European standard for emergency lighting luminaires, BSEN 60598-2-22, including a full heat test and EMC compliance test, before batch production and records are kept of the results obtained and the conversion method. By this process P4 is able to re-CE mark the resultant converted luminaires to signify full compliance to applicable European directives. Fastel Within is your assurance that converted mains lighting luminaires will have been fully tested to ensure that they will operate correctly and be expected to have a service life that is at least equivalent to purpose designed emergency lighting products but with the features and benefits of the incorporated technology with the industry leading customer service and after sales care of P4. P4 Limited, a leading active ICEL (Industry Committee for Emergency Lighting) member have been carrying out emergency conversions on third party luminaires for more than fifteen years (ICEL 1004 registration number 403029). All conversions are carried out to the requirements of EN60598-2-22 together with the additional requirements of ICEL 1004. All work is controlled by P4’s ISO 9001:2000 quality procedures which have yielded less than 1% guarantee claims over a five year period. All luminaire types tested for battery temperature and recorded. All luminaire types EMC tested. All luminaire types checked and noted for compliance. All ballasts checked for emergency compatibility. All conversions carried out in silicon low smoke and fume cable in compliance with forthcoming legislation. All conversions 100% function tested. Full warranty of converted luminaire. Conversion of mains lighting luminaires to emergency lighting operation in accordance with the requirements of ICEL 1004:2013 – Re-engineering of luminaires for emergency lighting use. Luminaires shall incorporate a (Fastel Standalone*/ Fastel Link*/ Fastel Wireless*/ Fastel SRM*) technology driver/inverter and be correctly rated to operate the luminaire lamp(s) and the resultant emergency lighting luminaires shall comply with the requirements of BSEN 60598-2-22. Records of conversion method, together with results of heat testing and EMC testing shall be retained in a technical file for reference. The warranty provided for the converted mains lighting luminaires shall be a minimum of one year, for emergency lighting drivers fitted for conversion five years and for emergency lighting batteries six years. 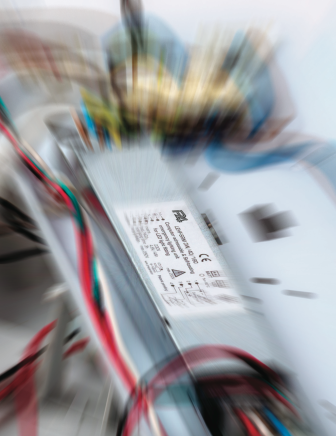 As Fastel Within – Conversion of mains lighting luminaires to emergency lighting operation.